We use the ProSecure STM and UTM series of Web and Email security appliances for a client’s where security is paramount. Tired of your employees using Facebook or Youtube? Turn it off. Are you afraid of getting a virus by going to an infected web site? Worried that employee’s personal email may infect your network? Not anymore. The ProSecure STM/UTM appliances use a Patent-pending Stream Scanning Technology. There is no store, scan and forward on these units. Rather as information, email or web traffic, is received it is scanned without delay. We have seen this technology is not only fast but also allows a significant savings on server AV tool. The AV on your server doesn’t have to work as hard when the STM or UTM is online. 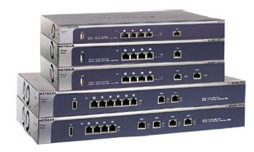 The STM appliance sits behind your firewall and before your main switch. This creates a secure scanning path for Exchange servers, web traffic, personal POP email and SMTP traffic. The unit can work independently or integrate to your domain using LDAP. The UTM replaces your existing firewall. It provides the same level of security and since it is at the network’s edge intrusion protection as well. Both units are flexible enough that you can program web access by user, deleting categories or only opening general web surfing at lunch for instance. Security and productivity wrapped into one.